A method of self-development, the Alexander Technique helps us become more aware of the way we move in our everyday activities. Learning the Technique helps us improve our awareness of muscle tension, balance and posture. Worrying about deadlines, attending important meetings or rushing to pick up the children from school, can lead to physical and mental strain. Over the years, the accumulated stress may cause illness, physical discomfort and common aches and pains. The best way to learn the Alexander Technique is by taking one-to-one lessons with a qualified teacher. We offer one-off introductory workshops on Saturdays and Sundays. Every Wednesday and Thursday lunchtime we have an introductory session. The aim is to give a basic explanation and demonstration of the Alexander Technique in an hour. Cycling is an increasingly popular activity. There are all kinds of cyclists: the around-town commuter, the racing cyclist and the touring cyclist. The Alexander Technique has something to offer all cyclists. 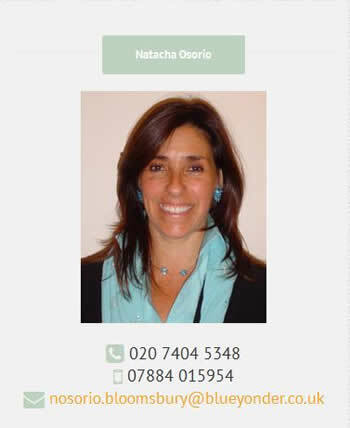 With a background in the performing arts, Natacha Osorio has been teaching the Alexander Technique since 1991, when she qualified as a teacher at the Constructive Teaching Centre for Alexander Technique in London. Over the years, she has worked extensively in her private practice, teaching people from all walks of life. She has also worked in various drama training institutions including Central School of Speech and Drama and Mountview Academy of Theatre Arts. This has given her the opportunity to investigate, develop and practise the Alexander Technique in relation to vocal and physical work. She has also been able to exploit her experience in pregnancy and childbirth when teaching the Alexander Technique. In 2006, she became Director of The Bloomsbury Alexander Centre and the Bloomsbury Therapy Centre. She is also experienced in giving talks at conferences, leading staff training events and in organising and delivering workshops and short courses for the corporate world.